Charleswood, Foothill Estates and Collingwood residents are actively engaged in their community and keeping them informed is our top-priority. 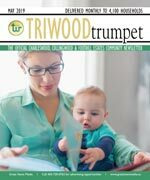 The Triwood Trumpet is the official community newsletter, and covers community news and is published monthly to keep content current and relevant. Delivered to every household, apartment, and business, every resident is acquainted with the community’s most important information. The communities of Charleswood, Collingwood and Foot Hills all belong to the Triwood community Association. The Triwood community association has the distinction of initiating many Calgary “firsts”. Triwood was the first community to build an arena, it was instrumental in bringing the sport of Ringette to Calgary, and it is home to the city’s first and only seniors slo pitch team. In the City of Calgary’s 2012 municipal census, Charleswood had a population of 3,421 living in 1,494 dwellings, a 1.9% increase from its 2011 population of 3,357. With a land area of 1.8 km2 (0.69 sq mi), it had a population density of 1,900/km2 (4,920/sq mi) in 2012. Residents in this community had a median household income of $63,828 in 2000, and there were 12.9% low income residents living in the neighbourhood. As of 2000, 17.6% of the residents were immigrants. A proportion of 11.6% of the buildings were condominiums or apartments, and 18.4% of the housing was used for renting. For more detailed info visit the City of Calgary community profiles.